Follow the Methane! New NASA Strategy for Mars? So You Want to Become a Physicist? What to Do If You Have a Proposal for the Unified Field Theory? All Entries Tagged With: "telescope network"
Researchers at the National Science Foundation used a global network of space telescopes to capture the historic first image of a supermassive black hole and its shadow more than 55 million light-years away from Earth. 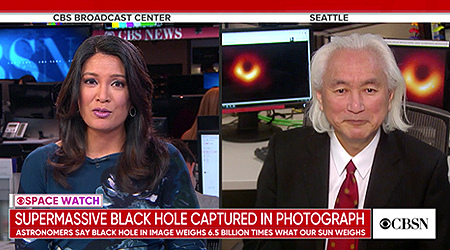 CBS NEWS science and futurist contributor, Dr. Michio Kaku, joins CBSN to discuss the landmark announcement from a studio in Seattle, where Kaku was visiting for his U.S. book tour to promote the paperback release of his national bestseller, THE FUTURE OF HUMANITY: Our Destiny in the Universe. Click to WATCH NOW! PRIVACY GUARANTEED. We will never share your email. Michio Kaku's national bestseller THE FUTURE OF HUMANITY is now out on paperback. Meet him in-person on his official Paperback Tour 2019! Michio Kaku‘s national bestseller THE FUTURE OF HUMANITY is now out on paperback. Meet him in-person on his official Paperback Tour 2019! Official Facebook Live Session with Dr. Michio Kaku about his national bestseller, now on paperback, THE FUTURE OF HUMANITY. FOR ALL PUBLIC EVENTS, CLICK HERE. © COPYRIGHT 2019 MICHIO KAKU. ALL RIGHTS RESERVED.